Ikeda’s first major solo touring museum retrospective exhibition “The Pen – Condensed Universe – “* opened in January this year. Its first venue was the Saga Prefectural Art Museum in Ikeda’s own home prefecture of Saga, where the exhibition was seen by over 95,000 people, breaking the museum’s visitor numbers record. It has just completed its second touring location at the 21st Century Museum of Contemporary Art in Kanazawa, and so far it has fascinated a wide number of people with a selection of approximately 120 works, ranging from pieces created in Ikeda’s school days to his current practice. Taking place seven years on from his 2010 solo exhibition “Focus” at Mizuma Art Gallery, this exhibition will center upon the Tokyo premiere of Ikeda’s newest work Rebirth. At three metres tall and four metres wide, Ikeda’s largest ever work to date, Rebirth took two years to conceive and three years and three months to execute, and was entirely created during a residency Ikeda undertook in Madison, Wisconsin, U. S. A. Looking at the work in its entirety, at its centre stands a massive tree with a profusion of flowers in full bloom, which bears an overwhelming sense of presence. However, focusing on individual parts of the work we gradually become aware of a great variety of different landscapes and stories unfolding within it. 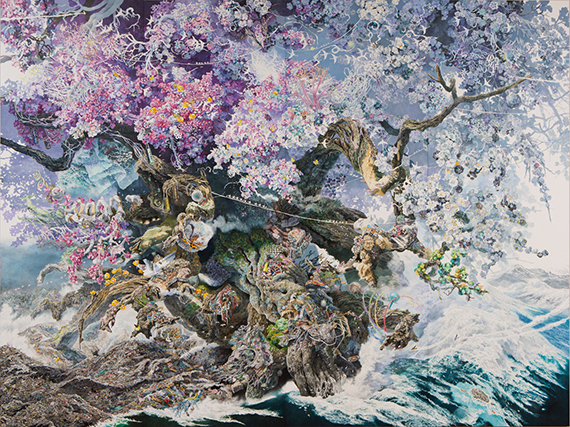 Part of the impetus for creating this work originated in the Great East Japan Earthquake disaster, and Rebirth throughout uses free and light imaginative and expressive capabilities to depict in juxtaposition the continuously recurring existence of disaster throughout the world, and the relationship between disasters and humanity. For Ikeda, who was living and working abroad at the time of the earthquake disaster, encounters with new landscapes and peoples in different countries have breathed new life into his work. Confronted with a large disaster, humanity cannot help but feel a sense of powerlessness, and yet perhaps precisely because the idea of continuing to live on, without losing hope, is so sincerely expressed within Ikeda’s work, this gives it its power to move the hearts of viewers. You are invited to take this chance to enjoy viewing the completed “Rebirth”, a masterpiece by Ikeda Manabu. In conjunction with the exhibition, the book 『《誕生》が誕生するまで』(“The Birth of Rebirth”) will be published by Seigensha Art Publishing, Inc. During the exhibition period we warmly invite you also to join the planned discussion event between Ikeda and the art critic Fuse Hideto, as well as a gallery talk by Ikeda. * Please note that from 27th September to 9th October 2017, the exhibition will tour to Nihombashi Takashimaya. Art critic. Born in 1960, he graduated with a Bachelor’s degree from the Fine Art department of Tokyo University of the Arts, and a Doctorate from the Art Anatomy department of the Graduate School of the same institution. Since then his career has encompassed working as Lecturer in Anatomy in the Faculty of Medicine of the University of Tokyo, and he is also the author of around 50 books, from “脳の中の美術館” (published when he was 28 years old), to his most recent publications “人体 ５億年の記憶” and “わかりたい！現代アート”. 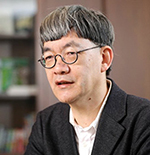 His critical writing also features in the monograph “池田学・Rebirthの誕生”, published this summer. For both events, please direct your reservation request via email to event@mizuma-art.co.jp . Please note that reservations will open from 11:00 JST on Saturday 22nd July..
We will respond with confirmations to all successful applicants, in the order in which requests are received. However, we ask for your kind understanding that the gallery is closed on Sundays, Mondays and public holidays, which may cause a slight delay in response time. ** Please note that for both events, reservations will close once capacity is reached.